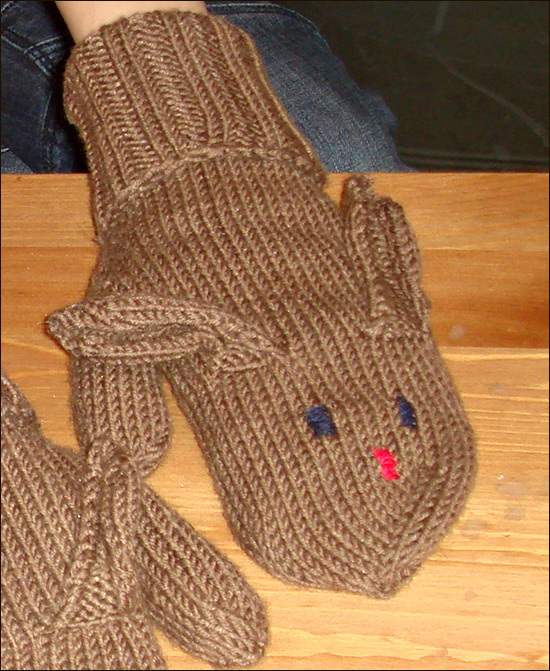 Hanna's Bunny mittens are finally finished, blocked, and, in the early morning hours, modeled and pictured. I would have liked to take the pictures in daylight, but Hanna insisted on wearing them to school, and, when your child insist on wearing your hand knitted items, then you capitulate. The pictures are taken with flash, and looks like that too. 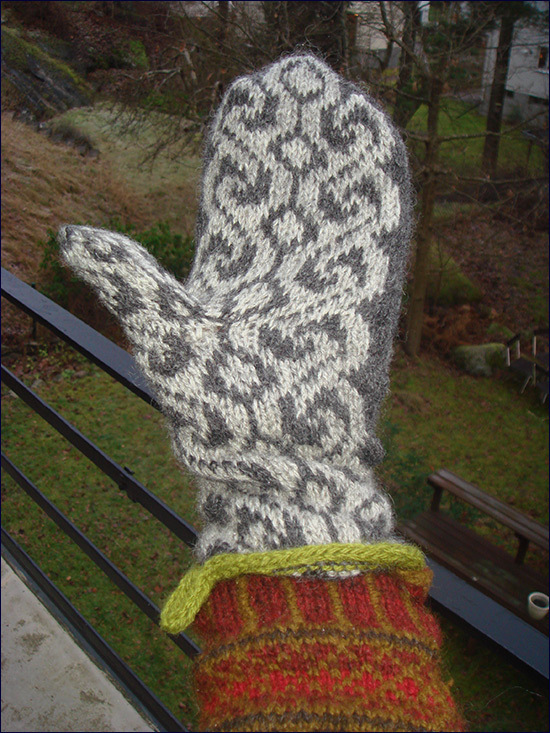 Pattern: Loosely based on the red mittens in Red Mittens by Toshiyuki Shimada in the book Northern European Knit Accessories 北欧のニットこものたち (loosely based because I simply don't read Japanese well enough to understand the directions completely). Yarn: Sirdar Sublime 75% merino, 20% silk and 5% cashmere (Can it get any better? The yarn is lovely and I'll use it again). Modifications: The ears are made loosely according to the directions from craftzine.com. I did cast on 7 stitches, and increased until I had 12 stitches. Look, she is wearing Chuck's cabled socks, still going strong! About Stockholm: I, the girls and the dogs moved to Stockholm in July last year. 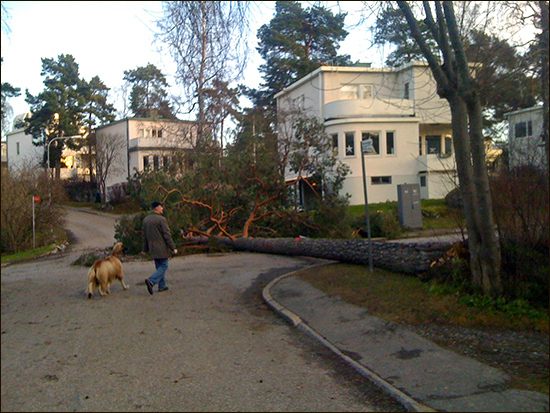 We have been living in Bromma, which is a part of Stockholm, and more exactly, in lovely Södra Ängby. The area consists of over 500 houses, build in the 1930's in pure functionalism. They are like sugar pieces dropped in the woody landscape. It's fascinating walking in the area, and incredibly beautiful (if you, like me, see beauty in the style). The house in Södra Ängby is rented. We wanted to explore the area more before we decide where we will settle down, and in the end of last year we found "our" house. It's a small house, not far from where we are living now, in an area also buit in the 1930's. The houses are like the Finnish "Rintamamiestalo", but were built ten years before the Finns started with the same concept, based on the Swedish model. The idea was enable people to build their home by them self, based on a standardized model. 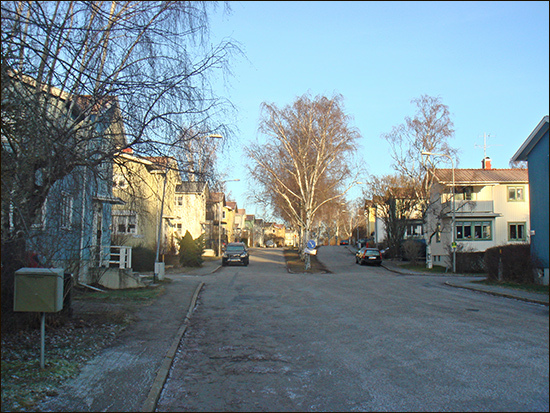 The houses in Norra Ängby are of twelve different models, and of them are seven common. A street was always designed with the same model of houses, and the area is thus very common in style. The yards are extremely well kept and the houses neat. It's a little bit like walking in one of the children book author Astrid Lindgrens's books. It has been a long time since last, and to be honest, I had to look up my password to Movable Type, in order to type this post. A lot of time has passed by, and almost non knitting has been done. I have started a couple of cowls, miserable, half inspired projects, abandoned them and put the needles to rest again. A lot of thing have happened, more about that later. I think it started in the beginning of December this year. My mother mailed me an article from Helsingin Sanomat, the big Finnish newspaper, featuring Arne and Carlos and their Christmas balls. 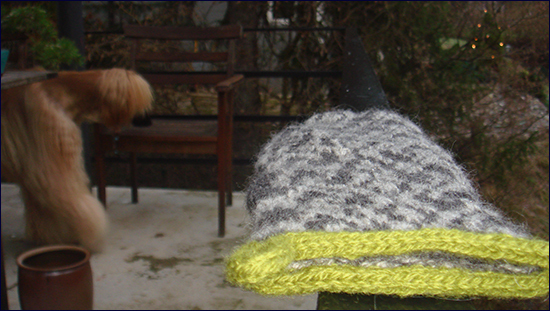 I did in fact knit two, but I have not yet come around to fill them up (have no real wool) and lightly felt them. Well perhaps for next Christmas ;) Then we had my husbands lovely nice visiting later in December. 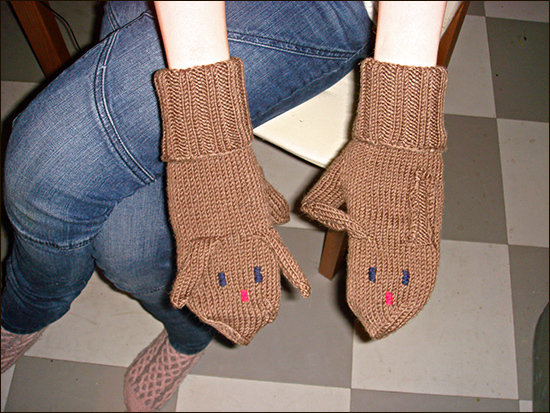 She mentioned that she would very much have a pair of handknitted mittens for Christmas. Nice idea I thought , but didn't do anything more about it. But after Christmas I suddenly found myself flipping through knitting books and webpages... In the search for the perfect pattern for Jenny I decided to test if I still like knitting mittens, and so I started a pair with stash yarn and a pattern from Anna Zilboorg's book Magnificent mittens. 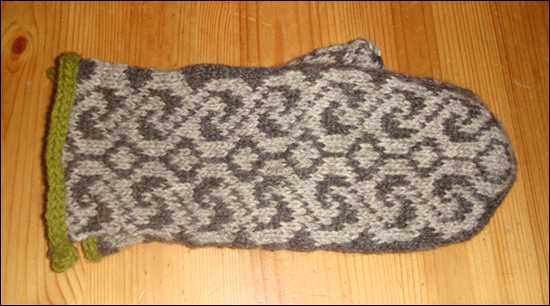 My gauge was, as it always has been with Anna's pattern, way off and I had to improvise somewhat. But the good thing is, the old knitting love was there, it felt good figuring out what to do and how. And knitting is like bicycling, the fingers new exactly what to do, how to keep tension and so on even though it has been three years since I made something more complicated. This first pair goes to my daughter Sofia. 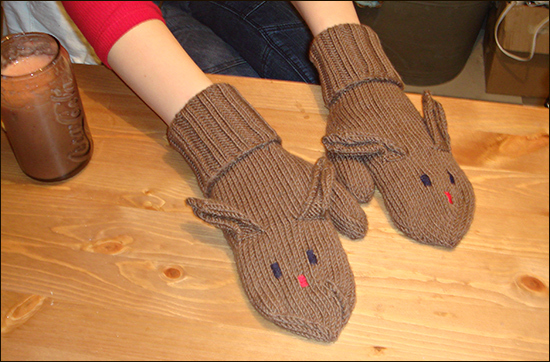 The girls were immediately thrilled when they found out there's once again a possibility to get handknitted mittens, and Hanna ordered a pair with bunny ears. I have decided on colours, yarn and pattern for Jenny's mittens, the yarn is already ordered from Strikk, and I have started knitting the bunny mittens. But I didn't dare to post about the first pair until I knew they were done and all right, in fear of posting once again a “Hey, I'm knitting again” and then letting the blog once again die. 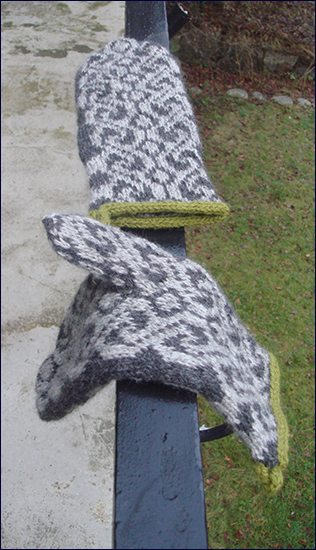 Modifications: The mitten is knitted from the top down, but the thumb from the bottom up. My gauge was so off the I didn't dare to start the thumb from the top. Instead I moved the thumb stitches to a thread, and casted on with the same amount of live stitches. Result: an invisible start for the thumb. The dark grey edge at the sides of the mittens should have been striped, I realized this too late, and decided to not rip up what I had knitted (afraid the fragile knitting love could have got hurt in the process, casting on with Anna's method is somewhat tricky). Silly close up complete with bonsai and Afghanhound to the left. Modeled on my way too big hand. And yes, it's Autumn Rose I'm wearing. 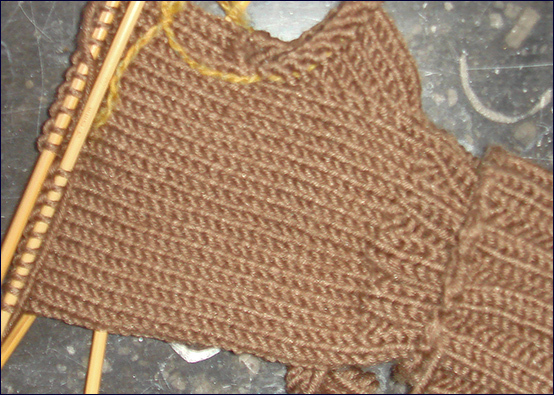 The beginning of the bunny mitten. Merino, cashmere and silk, can it get better? * Since my last post has a lot of things happened. My husband got a job offer he just couldn't refuse, and moved in the summer of 2010 to Stockholm in Sweden. I remained in Finland with our children for one more year due to the education of the children, and then in the summer of 2011 I and the girls moved to Stockholm. Our sons are grown up, and decided to stay in Finland, at least for now. Stockholm is a lovely city, and it's absolutely fantastic to live in a country where your mother tongue is the main spoken language (in Finland are only about 4% of the Finns speaking Swedish, so the difference is huge). I do miss my sons, my parents and in-laws, and a handful of friends very much, but the distance to Finland is short, and I have had the possibility to visit them several times already. My parents and the sons did also spend Christmas in Stockholm, which was lovely. Out dog pack has also grown with one, and the Afghans are now three. Olivia the canary did remain in Finland, and moved to my parents house, much to my niece Maya's joy. More on Stockholm in next post! Stay tuned!